When we’re putting my teachings into practice at my trainings, many people tend to ask for advice on things I just taught them. This usually makes me wonder, did the learner listen to what I just said, because it should be impossible to forget that fast, right? 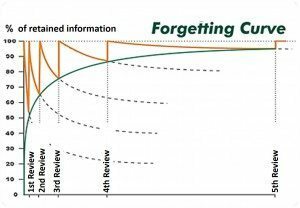 However, according to Ebbinghaus’s definition of the forgetting curve almost 60 percent of newly learned things are forgotten during the first hour. If learnings are not repeated or recollected, they will be forgotten. If you repeat the learnings every few days and brush up your skills first one month and then three months after the initial training session, you will memorize the learnings much better. Five repetitions will make sure the learnings stick in your mind. Of course it takes time and money to organize multiple trainings instead of one, but it’s an investment worth making. Whenever possible I try to use the principles of the 70:20:10 theory in my trainings. I’ve also tried to speak about the significance of repetition to my clients, but it hasn’t always borne fruit. Obviously this feels odd taking into account the forgetting curve: we’re ready to invest in trainings but not in maintaining the obtained level. I was extremely satisfied, when I was offered the chance to train a two-day course that had the first training day in May and the second in August. Between the course dates there was plenty of time for independent training (and forgetting). I used the same method in trainings I had in late August and early September. We used half of the second training day to repeat previously learned things, and based on the experiences the method really works! I got loads of positive feedback and I also noticed the difference in the participants. The pace was just right, there weren’t too many new things the participants would had to adopt, and a lot of time had been reserved for the hands-on training. In a matter of fact, the training was so successful that we talked about having yet another similar training session later this fall. HRD departments should pay more attention to repetition in enterprise learning. Having multiple training sessions is one solution, but you can also use various digital tools that make it easy to repeat the previously learned. For instance, our Habit coaching and eLearning tool allows you to build a training program that can last for weeks or months. The learner does tasks, studies materials, answers questions and continuously reflects on all the things he has so far learned on the course. You can try it out yourself! Fill in you e-mail address below and I will give you FREE access to one of my OneNote trainings.